Clear Secure Badgeholder Classic with BloxProx provides protection for HID Proximity tap and go 125Khz* IDs and Access cards as well as protection for 13.56Mhz Access and ID cards. Our Secure Badgeholders are made of extremely durable polycarbonate. The springs are stainless steel, ideal for salt-water environments. Insert and remove your card from the top. The state of the art unique open face design keeps the card locked-in to prevent loss, yet allows easy access to remove the card when neccessary. * 125Khz cards are incredibly hard to block due to their low frequency range. Our new technology will provide protection in almost every daily use of the card and badge holders. 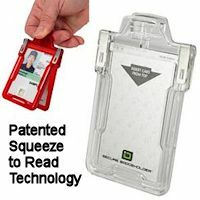 If the card and badge holder in its protective position, were presented to a reader, and held 'on the reader' for an extended period of time, a read MAY be made, but the likelihood is slim. However, readers vary greatly and there may be a stray occurrence with extended presentation to the reader, even in the optimum protective state.